Krishna can be understood only by the process of undivided devotional service. He explicitly explains this in this verse so unauthorized commentators, who try to understand Bhagavad-gita by the speculative process, will know that they are simply wasting their time. No one can understand Krishna or how He came from parents in a four-handed form and at once changed Himself into a two-handed form. It is clearly stated here that no one can see Him. Those who, however, are very experienced students of Vedic literature can learn about Him from the Vedic literature in so many ways. There are so many rules and regulations, and if one at all wants to understand Krishna, he must follow the regulative principles described in the authoritative literature. One can perform penance in accordance with those principles. As far as charity is concerned, it is plain that charity should be given to the devotees of Krishna who are engaged in His devotional service to spread the Krishna philosophy or Krishna consciousness throughout the world. Krishna consciousness is a benediction to humanity. Lord Caitanya was appreciated by Rupa Gosvami as the most munificent man of charity because love of Krishna, which is very difficult to achieve, was distributed freely by Him. And if one worships as prescribed in the temple (in the temples in India there is always some statue, usually of Vishnu or Krishna), that is a chance to progress. For the beginners in devotional service to the Lord, temple worship is very essential, and this is confirmed in the Vedic literature. One who has unflinching devotion for the Supreme Lord and is directed by the spiritual master can see the Supreme Personality of Godhead by revelation. For one who does not take personal training under the guidance of a bona fide spiritual master, it is impossible to even begin to understand Krishna. The word tu is specifically used here to indicate that no other process can be used, can be recommended, or can be successful in understanding Krishna. The personal forms of Krishna, the two-handed form and the four-handed, are completely different from the temporary universal form shown to Arjuna. 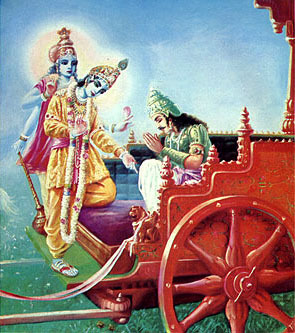 The four-handed form is Narayana, and the two-handed form is Krishna; they are eternal and transcendental, whereas the universal form exhibited to Arjuna is temporary. The very word sudurdarsam, meaning difficult to see, suggests that no one saw that universal form. It also suggests that amongst the devotees there was no necessity of showing it. That form was exhibited by Krishna at the request of Arjuna because in the future, when one represents himself as an incarnation of God, people can ask to see his universal form. Krishna changes from the universal form to the four-handed form of Narayana and then to His own natural form of two hands. This indicates that the four-handed forms and other forms mentioned in Vedic literature are all emanations of the original two-handed Krishna. He is the origin of all emanations. 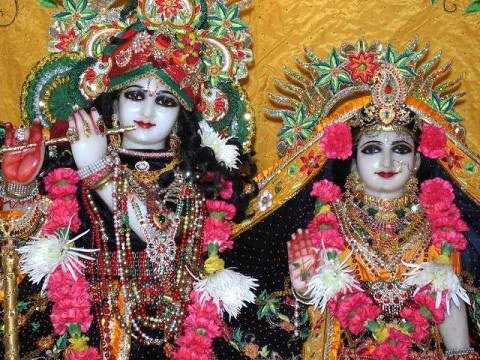 Krishna is distinct even from these forms, what to speak of the impersonal conception. 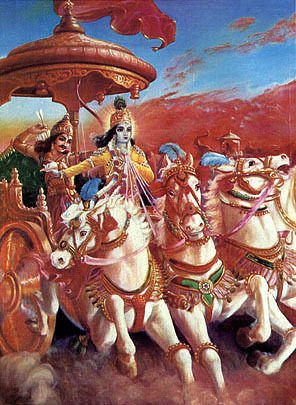 As far as the four-handed forms of Krishna are concerned, it is stated clearly that even the most identical four-handed form of Krishna (which is known as Maha-Vishnu, who is lying on the cosmic ocean and from whose breathing so many innumerable universes are passing out and entering) is also an expansion of the Supreme Lord. Therefore one should conclusively worship the personal form of Krishna as the Supreme Personality of Godhead who is eternity, bliss and knowledge. He is the source of all forms of Vishnu, He is the source of all forms of incarnation, and He is the original Supreme Personality, as confirmed in Bhagavad-gita. In the Vedic literature it is stated that the Supreme Absolute Truth is a person. His name is Krishna, and He sometimes descends on this earth. Similarly, in Srimad-Bhagavatam there is a description of all kinds of incarnations of the Supreme Personality of Godhead, and there it is said that Krishna is not an incarnation of God but is the original Supreme Personality of Godhead Himself. Krsnas tu bhagavan svayam. Similarly, in Bhagavad-gita the Lord says, mattah parataram nanyat: "There is nothing superior to My form as the Personality of Godhead Krishna." He also says elsewhere in Bhagavad-gita, aham adir hi devanam: "I am the origin of all the demigods." And after understanding Bhagavad-gita from Krishna, Arjuna also confirms this in the following words: param brahma param dhama pavitram-paramam bhavan: "I now fully understand that You are the Supreme Personality of Godhead, the Absolute Truth, and that You are the refuge of everything." 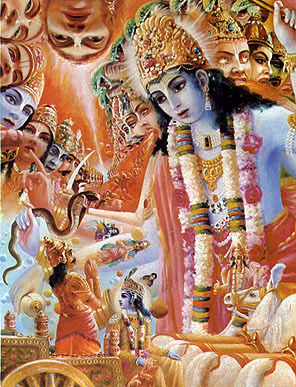 Therefore the universal form which Krishna showed to Arjuna is not the original form of God. The original is the Krishna form. The universal form, with its thousands and thousands of heads and hands, is manifest just to draw the attention of those who have no love for God. It is not God's original form. The universal form is not attractive for pure devotees, who are in love with the Lord in different transcendental relationships. The Supreme Godhead exchanges transcendental love in His original form of Krishna. Therefore to Arjuna, who was so intimately related with Krishna in friendship, this form of the universal manifestation was not pleasing; rather, it was fearful. Arjuna, who is a constant companion of Krishna's, must have had transcendental eyes; he was not an ordinary man. Therefore he was not captivated by the universal form. This form may seem wonderful to persons who are involved in elevating themselves by fruitive activities, but to persons who are engaged in devotional service, the two-handed form of Krishna is the most dear. *Special thanks to Jaya Murari Prabhu for his beautiful Deity photos from New Vrindaban.